Vault of Light: Planning professions! I mentioned in my last post that I've been doing RaF with myself. The end result will be seven new characters at level 85 which I'll then level to 90 as quickly as I can. What this means is I'll have fourteen new profession slots. I'll also be using my free level 90 from pre ordering Warlords of Dreanor to give myself a Rogue. Meaning another two profession slots. While I've been leveling I've been sending everything I pick up to an alt to store in a guild bank. The cloth I will be using to level tailors. I'll use what I craft to Disenchant for materials to level a second and third Enchanter. I've been buying any herbs / ore under market price to level Blacksmithing/JC/Alchemy and Inscription. Here's what I'm hoping to end up with by the end of this. If you think I'd be better off with different professions on different characters then feel free to chime in! Any suggestions are more than welcome! My Priest is my main and has JC/Enchanting with all patterns however because she's my main it means she also seldom has much in the way of bag space! So having a second character capable of shuffling ore is a must. I've tried to double up on all crafting professions which currently have a cool down and hopefully will continue to do so in Warlords, Blacksmithing, Tailoring and Leatherworking. I'm not 100% sure about the Tailoring on the Warrior although I've had it in the past. Getting that extra cloth on a class which can quickly blitz though instances or mobs is great. Although it's rare that I actually farm. The ability to learn patterns quicker is a huge bonus. Ideally my third Enchanter would be my third most played character, being able to DE your gear once you're done with it has always worked out well. Drops in LFR/Flex you don't need? DE them! In terms of third most played I think that'll end up being my Monk or Mage. But at the same time having Enchanting on a character who runs older content has always been a favorite of mine, I'd really like a Plate wearer with Enchanting as they'll be doing a lot of Transmog runs, I adore Plate mogs! Anything that I'm not sure about I've coupled with Alchemy because Alchemy always gets neat transmutes each expansion. Haha, with each expansion the pain grows! is the rogue going to be a worgen with skinning? I rolled skinning on my worgen dk just because of Kara leather farming! Great to spend 2-3 mins on while posting items/collecting mail on main account ^.^ or just as a "goblin" daily. Leather + dust <3 twitpic.com/c1udlw Level 90 boost even less people levelling up even less raw materials like leather from old zones. i'd try and get another LW in there for the CD and to learn patterns quicker ( leather + mail so many patterns to learn! ) Maybe on the DK or druid. I keep re-jiggling them every few days anyway! 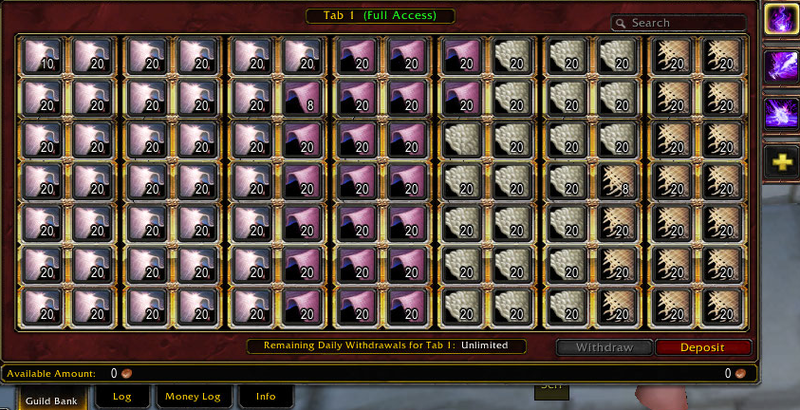 For the moment I'm going to lvl one of each and keep the slots open until I hear a bit more about WoD. Also nice to hear from you!